So how do you know which one is best for your feline companion? Based on our research, the best dry cat food brands cover a wide range of price, flavor, and nutrition profile. Plus, our furry friends love them. That’s sort of important, right? So, What Are Bad Cat Food Ingredients? Dry vs. Wet vs. Raw: Which Is The Best Cat Food For Our Felines? 1. Why is it important to buy my cat different food according to her current life stage? 2. Should I use the feeding recommendations on the food label? 3. Is my pet overweight? 4. Can my kitty have “people” food? 5. Can cat food go bad? 6. How much should I feed my cat? 7. How much water should I give her? 8. Why does my cat eat only from the middle of her bowl? 9. 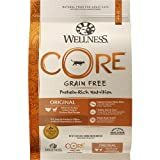 Should I change up my cat’s food from time to time, or keep it the same? 10. When should I transition my cat from kitten to adult cat food? food ratings is Nulo. This American-based, independently-owned pet food company offers the best of what pet nutrition has to offer, including dry and wet food. It’s also free of synthetic ingredients, fillers, preservatives, and artificial flavors or chemicals. It offers a high concentration of healthy animal-based protein. Instead of rice and wheat, it contains carbohydrates like peas, chickpeas, and sweet potatoes, making it a great low carb dry cat food. It’s low on the glycemic index. Nulo has patented probiotics that help regulate your cat’s digestion and immune system. The company has pledged to work with family farmers and ranchers who use sustainable practices. They emphasize the use of free-range beef, chicken, and turkey, and wild caught fish. Nulo facilities (in Kansas, Nebraska and South Dakota) are approved by the USDA, FDA, and AAFCO, undergo annual inspections, and consistently receive superior ratings. 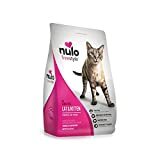 Nulo also offers the best food for indoor cats. Their Indoor Cat Chicken & Cod recipe is specially formulated to help keep indoor felines lean, even though they get less physical activity compared to their outdoor counterparts. In addition to Nulo, we found six other products in our research that met our criteria for best food brands. These are easy to find online and are sold in most major pet supply stores. Their products are free of additives, preservatives, by-products, and fillers. Samples of their food are tested following a quality control protocol. They use a combination of fresh and frozen meat from suppliers who meet strict quality standards. Foundation and the Human Animal Bond Research Initiative to help animals in need. Potential drawbacks? Some customers have found that Wellness canned products appear to have less food in it than advertised. This could be explained by settling of the product, however. It’s also due to the fact they don’t use artificial gels, stabilizers, and emulsifiers. This means the consistency of their grain-free food will naturally vary. Based on your cat’s “ancestral diet,” Taste of the Wild is a premium brand that is completely grain-free and high in protein, true to your kitty’s carnivorous history. All their products are vetted by a team of animal nutritionists and veterinarians. The Fromm Family Pet Food company is a Wisconsin-based and family-run organization, now five generations in the making. Their founders maintain close regulations over the sourcing, production, and packaging of their pet food. They use an outside lab to test all their products for bacteria, and employ strict quality assurance guidelines throughout every step of development. None of their ingredients come from China or other Asian countries. Like the other top five brands, Fromm products contain no artificial ingredients or preservatives, either. They offer a variety of custom blends, including dry kibble and canned pâtés. “Biologically Appropriate” pet food is Orijen’s trademark promise. Their whole and natural ingredients are sourced from regions throughout North America. Based in Kentucky and Canada, they never outsource production to other companies or manufacturing facilities. This gives them the ability to carefully supervise and regulate their cat food products. Their dry and wet cat foods, as well as freeze-dried treats, have won dozens of awards and are recognized for their quality and taste. Castor & Pollux’s Organix brand was founded by pet owners who wanted to provide natural and organic food to animals around the country. They consult with animal nutrition experts to develop wholesome and balanced food products for dogs and cats. In addition to using high quality ingredients (and none of the bad), this company also gives back to the community. To date, they’ve fed over 6 million meals to pets in shelters and foster homes. They also work with non-profit rescue organizations through their PetWorks Partner program to help at-risk animals receive healthy diets. Nature’s Logic claim to fame is the first company to offer completely chemical-free dry, wet, and frozen cat food. The US-based and family-owned company offers a range of animal proteins in their products for easy rotation to prevent allergies. These foods are easily digestible and full of natural antioxidants, enzymes, and probiotics. Nature’s Logic food is highly nutrient dense. For many cat owners, this means they can feed their animals less, saving money over time. Looking for other natural cat products? In addition to dry kibble and canned wet food, Nature’s Logic also offers a line of natural kitty litter, treats, and supplements. Though this company is based in New Zealand, ZiwiPeak makes sure that its ingredients are sustainably derived from the highest quality sources. They naturally air-dry their products to increase the foods’ digestibility and nutritive quality. Their proteins come from sources including meat, organ, raw bone, and regional-specific green-lipped mussels. More than 90% of their food are animal-based, making this as close as possible to a cat’s evolutionary diet. The rest of the cat food is supplemented with vitamin-rich, low glycemic carbohydrates including herbs and kelp. Of over 200 pet foods, ZiwiPeak brand has come in first on independent pet nutrition research. They pledge to work with suppliers who maintain ethical and humane practices. Are you an environmentally-conscious cat owner? Then you’ll like ZiwiPeak, since they also have a lower carbon footprint compared many North American and European competitors. Dry food is a convenient choice for most pet parents. The best dry cat foods should be nutritious, delicious, and affordable. This product is intended for adult animals. It contains five key indicators of healthy nutrition: essential vitamins and minerals; probiotics and prebiotics; fiber; fatty acids; and healthy proteins and carbohydrates. Just take a look at the first two ingredients: de-boned chicken and turkey. Readable, real, and healthy, right off the bat. It’s pricey, but comes in a big bag, so it lasts a long time for most cat owners. 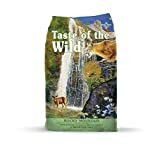 This high protein natural dry food for cats from Taste of the Wild comes in either a 5 or 12-pound bag. It contains real animal protein (including trout, salmon, chicken, and venison), giving your four-legged friend an optimal mix of amino acids. This “highly digestible” food also contains low-GI carbohydrates like raspberries, blueberries, and peas. 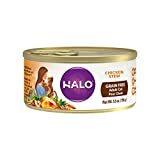 If there’s anything negative about this food, it could be that cats like it so much they might eat too much too fast if given the opportunity, at least according to some users. Fromm’s FourStar is a unique dry kibble option. In addition to duck and turkey, the product also offers quail and pheasant meat, which is tough to find in other brands. Customers have noted that their cats’ skin and coats became shinier and fuller when they switched to this product. Some cat owners have even noticed that their pets shed less, which could be due to an increase in the health of skin and hair follicles. You may notice that your cat’s digestion improves while eating this food, too. It comes in a small 5 lb bag, for a single-cat family this can typically last around a month. A few customers have noted that the seal on the bag doesn’t close properly. For freshness, you may need to use a sturdy kitchen clip or something similar. Orijen’s Food comes in a 12 lb bag, making it more cost effective compared to some of the other brands listed here. It contains the right blend of proteins, carbohydrates, and micronutrients that can help your cat maintain a lean and healthy weight. It’s also more nutrient-dense compared to other brands. Just be sure to check the feeding recommendations, as they may be slightly different. Some reviewers note that their felines don’t seem to lose interest in the dry food, which is common with many kibble brands. However, other customers have noted that their cats don’t enjoy the taste. For these people, the high price doesn’t seem to be as worthwhile. 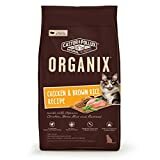 Castor & Pollux’s Organix Chicken & Brown Rice Recipe comes in a 4 lb bag or a 12 lb bag variety. Made in the USA, this kibble also contains flaxseed which promotes a healthy skin and coat. Customers have noted that irregularities with their cats’ digestion (including vomiting and diarrhea) go away when using this kibble. This product does have a slightly higher carbohydrate content since it contains brown rice. So, it may be less ideal for cats who are overweight or mostly sedentary. From the pet food brand that came in at the top of our review, Nulo’s Dry Cat Food contains the finest all natural ingredients, sourced from the US. It’s been recommended by veterinarians and an excellent choice for active adult cats. As far the taste goes, it seems to be hit or miss. Some owners note that their cats don’t love the food, while others say even their older pickier felines can’t get enough of it. 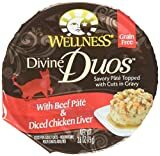 The Wellness brand Divine Duos With Beef Pâté & Diced Chicken Liver sounds pretty decadent. It has an easy-to-open peel-off lid, giving you easy access to the nutrient-dense and moisture-rich food inside. Of course, if your cat doesn’t require the entire package, this removable lid can make it a little trickier to seal and store. Fortunately, most reviewers seem to note that their cats love the taste. People with older and chronically ill cats have also used this food successfully. It’s low in phosphorous, which is critical for animals with kidney issues. 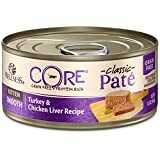 This selection of Nature’s Logic Feline Beef Feast Canned Cat Food comes in a case of 12, making a bit more cost-effective and convenient. The wet food is moisture-rich, easily digestible, and mostly animal-based. Carbohydrates come from vegetables and fruits, keeping the calorie content low. This wet food also contains eggshell calcium and animal plasma, unique and potent sources of vitamins and minerals. Halo Spot’s Stew For Cats Wholesome Chicken Recipe works well for animals of all ages. For kittens, the company recommends feeding up to twice the adult amount to ensure your young cat gets enough calories and protein. It’s full of chicken meat, broth, and liver, along with healthy veggies including carrots, sweet potatoes, zucchini. One downside: this product contains garlic powder. Garlic is known to be harmful to cats and dogs in large amounts. If you give your pet this product, be sure to monitor its reaction. You also may want to consider switching out this product every few months to avoid too much garlic intake. ZiwiPeak Canned Cat Cuisine New Zealand Beef Recipe is among the highest quality pet food products available. The beef comes from free-range and grass-fed cattle. Cows used for this product are never given antibiotics or hormones, which can be harmful to animals and humans. This product also contains green lipped New Zealand mussels. These marine animals are a natural source of chondroitin and glucosamine, which are great for your cat’s joints. Reviews are highly positive, and overall cats seem to love the taste. Some customers note that their cat experiences stomach upset if they switch out the flavors from beef to another variety too quickly. Fortunately, this can be avoided by gradually introducing new foods over the course of a few days. It’s worth remembering that not all felines need the same thing. Individual factors, including age, lifestyle, and the presence of chronic health disease will have a big influence on the food that’s best for your animal. Consider this, for instance: kitten nutrition. Like babies and young children, young cats go through fast growth spurts, as much as tripling their weight in the first couple weeks of life. Now, imagine just how much calories your little kitty cat is expending just to simply grow and play. With such a high energy expenditure, it can be tough for kittens to get in enough calories that will support normal growth. To get your kitten started off in life on the right paw, you should feed your kitty three to four times per day. Like adults, kittens also need fatty acids, vitamins, minerals, and other micronutrients. But protein is where a kitten’s nutritional needs differ from adult cats. As much as 30% of a kitten’s calories should come from healthy animal-based protein. So, how old is a “kitten” anyway? Consider your feline a kitten until it’s at least 1-year-old. Veterinarians recommend giving your cat a specially formulated kitten food until your feline friend is at least that age. Wondering what the best food for kittens actually is? Our research points to Wellness Core Natural Grain-Free Wet Canned Kitten. Compared to other kitten food brands, this formula has a higher concentration of protein and amino acids. Both protein and amino acids are important for healthy organ, bone, and muscle development. The Wellness kitten formula also offers high amounts of essential omega-3 fatty acids, including DHA. This is critical for brain and eye development, both of which grow and change rapidly as your kitten ages. Customers like it, too. People note that their kittens have high energy, healthy skin and coat, and regular digestion while on this food. Some of noted that the cans are in better shape when bought in-store vs. online. Overall though, feedback is positive. Grains and high carbohydrates like rice and soy can spike your cat’s blood sugar and cause her to gain weight. Cats are obligate carnivores and don’t digest carbohydrates well, so they don’t need as many, anyway. Look for carbohydrates like chickpeas and sweet potatoes. These have fewer calories, are more easily digested, and have more nutrition compared to wheat, soy, rice, and corn. Whenever possible, go with US-based companies. These companies tend to be better regulated and source higher quality ingredients. As a consumer, it’s your job to ensure you’re purchasing the best quality food that fits your budget. To do this, it’s important to get comfortable reading the ingredients list on any product you buy. Because it’s not just what’s in the ingredients that matter. What’s not in the ingredients is critical, too. What’s the purpose of the food? Is it intended for adult cats, kittens, or cats with certain health conditions? You need to be sure that your pet is getting the right nutrients for its needs. What’s the net weight? Labels should list the recommended serving sizes based on your cat’s needs. Knowing the net weight will give you an idea of how many servings you can get out of each product. Knowing this can help you determine which brand is most cost-effective. What are the first few ingredients? Ingredients are listed in order of weight, from highest to lowest. Animal meat, boneless meat, or organs should always be the first few ingredients. Avoid anything that mentions by-product. These are poor in quality. Good ingredients include things you can read, and things you may even find in your own fridge. Where do these ingredients come from? You should choose companies that source their ingredients from sustainable farmers and suppliers. Food that comes from Asia tends to be low in quality. Plus, their animals tend to be treated inhumanely. Are there any grains, soy, or corn? You should avoid these types of carbohydrates. They can promote weight gain, inflammation, and poor blood sugar control. What is the Guaranteed Analysis? This chart details the percentage of different ingredients, including protein, fat, fiber, phosphorous, and other nutrients. Your vet can help you determine what’s the ideal percentage of each for your pet. For instance, most felines need around 30% crude protein and low amounts of phosphorous (to promote healthy kidneys). Premium brands use sustainable manufacturing processes. They source their ingredients from parts of the world known to use ethical and humane raising and farming practices. Real animal protein. These should be clearly listed so you know exactly where it comes from. This includes chicken, beef, eggs, venison, lamb, salmon, sardines, mussels, and duck. Organ meat (e.g., chicken or beef liver) is a bonus. Vegetables and fruits. Most of the carbohydrates should be veggies and fruit you might have in your fridge. Look for things like sweet potatoes, carrots, zucchini, apples, and berries. Good fats. These are naturally present in animal proteins but can also be supplemented. This includes omega-3 fatty acids, also known as EPA, DHA, and ALA. Herbs and marine plants. This may include basil, dill, thyme, rosemary, sage, and kelp. Feeding your pet high quality nutrition helps prevent disease, increase its lifespan, and improve its energy levels. Who wouldn’t want that for their furry friend? But quality nutrition isn’t just about what goes into the products. It’s also about what stays out, too. Bad ingredients are basically anything that is cheap and sourced from China and other Asian countries. At best, they’re unhealthy and not great for the environment either. At worst, they’re potentially toxic to your feline. Low quality ingredients can worsen or cause health problems in cats. This includes diabetes, kidney disease, cancer, and obesity. Like humans, cats really are what they eat. If they’re eating poor quality foods, then health will suffer. Here’s a basic rule: if you can’t pronounce it, it’s probably not a good ingredient. Avoid products that are packed with strange words. Another good rule: the shorter the better. Top-of-the-line best cat food products contain fewer ingredients. But, their ingredients are much higher quality, so they offer plenty of what your cat needs and none of what it doesn’t. Foods like “natural” and “premium” aren’t regulated by the FDA. This means that a food label can claim to have “natural” ingredients but may still contain artificial preservatives and other junk. Look for legally regulated words, like “grass-fed,” “free-range,” and “organic.” “Human-grade” (as in, if it’s good enough for you, it’s good enough for your pet) can only legally be used by certain companies. If a pet food recall happens, it’s often due to a problem at the facility that made it. Recalls aren’t necessarily due to the specific ingredients themselves. For instance, “rendering facilities” often use vague “meat meal” ingredients. These are mysterious animal products that may come from factory-farms, slaughterhouses, or even animal shelters. Good pet food companies closely regulate their manufacturing facilities. They assess their employees, equipment, and production for quality control. Your best option is to stick to companies that are US-based, like most of the companies listed previously. Food is tricky. Just because your cat can eat it doesn’t guarantee that your cat’s body will be able to digest it properly. Digestibility refers to the amount of food and nutrients actually absorbed. Low quality ingredients like fillers, artificial preservatives, and animal by-products, aren’t well-absorbed. In some cases, these poor ingredients can even block the digestion of whatever good ingredients are left in the product. Whatever isn’t absorbed is excreted. One factor that influences digestibility is moisture level. Higher quality, moisture-rich foods help improve the amount of food that is digested by your cat. This brings more vitamins, minerals, and nutrients to the tissues throughout your cat’s body. Companies that produce pet food don’t have to report the digestibility of their products. Some do, but there is no requirement for third-party testing to confirm these amounts. Ask three different people about the best cat foods out there, and you’ll probably get three different answers. The main options (dry, wet, and raw food diets) all have their own benefits and drawbacks. Making the choice between the three options really comes down to what you find to work best for your cat. As mentioned, dry cat food is convenient. Many cat owners prefer this type because they can leave it out, allowing their cat to eat as they please. Dry food (called kibble) also has a long shelf life, and is usually the least expensive option. Choosing the healthiest dry cat food (from one of the five listed above) will help ensure that your cat gets all the nutrients it needs. Though companies claim that dry food is better for dental health (compared to wet option), there’s not much evidence to actually support this. Some veterinarians and animal experts recommend wet food over kibble. In general, canned wet food has a much higher water content. This can help your cat stay well-hydrated. For felines with certain chronic health conditions, such as kidney disease, canned wet food may be a better option. A potential drawback is that compared to dry food, canned wet food for cats is a bit more expensive. Plus, it’s less convenient to open, serve, and store. A raw food diet is completely natural and mimics a “wild” diet. This means that cats eating raw food receive mostly fresh and unprocessed meat and organs. A raw cat food diet is generally free from things like BHA and BHT. These are chemical preservatives and are potentially harmful to animals (and humans, for that matter). A limiting factor for many people is the increased amount of money and work that goes into providing this kind of diet for their cats. Food must be prepared daily and stored properly to prevent spoiling. Finding and purchasing raw food takes some effort and costs even more than wet food. Some companies offer pre-made raw food blends, complete with proteins, vitamins, and minerals. With a little research and trial and error, it is possible to find and prepare raw cat food yourself. Ideally, most experts agree that blending all three types of foods together is optimal for kitty health. For you, try giving your feline friend kibble and occasionally top with wet food. Supplement the diet with raw food every now and then. You care about the health, well-being, and longevity of your feline companion. But you care about how you spend your money, too. These reviews are meant to help you navigate the pet store with confidence. Understanding the healthiest cat food brands will give you peace of mind, knowing that your money is well spent. The bottom line: Pay attention to labels, and pay attention to how your cat responds to the food you give it. Is your cat’s energy level high? Does it have a healthy coat and skin? Is your cat’s chronic health condition improving? All of these questions can help you and your vet determine the best type of food to get. Keep in mind this may change over time, too. If you’ve bought any of these products before, be sure to let us know what you and your cat think about it. Lastly, is there a fellow animal lover in your life? Send this article along. Your friend (and their cat) will thank you. Like humans, animals have different nutritional and health needs depending on their age. As an example, kittens need diets rich in protein and calories in order to support fast-paced growth and development. Older cats may need low-calorie food or one with specific nutrients to minimize the risk of weight-gain and age-related health issues. “All life stage” option is not advisable for certain animals and may have unintended adverse effects. Your best bet is to consult with your veterinarian so he or she can help you make a more informed decision. While helpful as general guidelines, feeding recommendations on the bag labels may not be the right fit for your feline depending on her age, overall health status, and lifestyle, so consult with your vet. Run your hands along her flank—you should be able to easily feel but not see her ribs. Look down at your feline from above—there should be a clear narrowing at the waist. Look at your kitty from the side—you should see a narrowing from this angle, too. Avoid the temptation to slip her scraps from your plate. Aside from the risk of accidentally giving her something toxic, giving your feline small treats can easily lead to weight gain and nutrient imbalances. All feline food should be used before the expiration date on the label. If your kitty is “free feed,” you can leave her dry granules out as long as it isn’t moist or exposed to high heat. Canned food should be thrown away after it’s been left out for 4+ hours, and opened cans can be stored in the fridge for up to a week. Wash and refill your pet’s food and water dishes at least weekly. As mentioned, the amount you feed your pet depends on its age, health status, activity level, and a few other factors. Your vet can help you determine how much is right for your animal. A typical 10-lb kitty needs only around 250 calories per day to maintain an appropriate lean body mass. Always have fresh water available for your animal! Proper hydration helps her digest her nutrients and avoid health problems like dehydration and urinary tract infections. If your cat’s dish is too deep and narrow, then she may struggle eating out of it because the sides of the dish can cause pain if her sensitive whiskers bump up against them. To compensate, she may try to eat out of the center only. This is highly individual and depends on the unique preferences and health needs of your furry friend. If you want to change your pet’s food, do it slowly and introduce new things to her diet in small amounts. Expect to change over your kitten’s food around age one. Transition slowly and be sure to monitor her response to ensure she’s adjusting well.